[Product Specifications] ● Package Size: W460 × H420 × D360mm ● Size: H400 × W260 × D420 ● Age: 0 years old 10 months ● battery: AAA alkaline batteries × 2 (sold separately) ● weight: 2.3kg ● material: PP, ABS, POM, SBS ● The contents of goods: the main body (1) , seat box (1), the voice unit (1) ● Country of origin: according to the China [Product details] baby's growth, returned from the Walker to the rider! The basket of Walker mode you carry put a favorite toy. 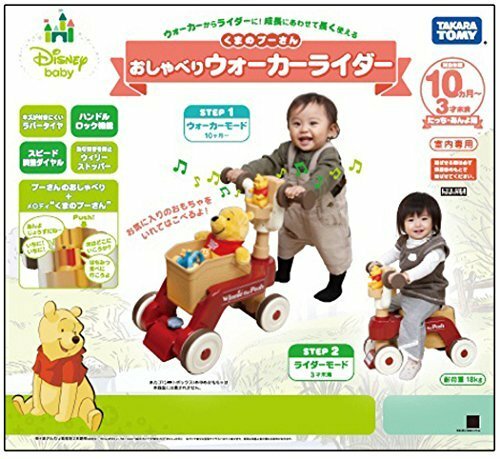 Winnie the Pooh is also contains pleasant music or talk a lot, promote by Anne baby in playing. "In a position, to position" in Walker mode as the words to encourage by Anne baby with or take the rhythm, the rider mode to enjoy together, such as "Wow! Ne fast" "Where shall we go next" and the Do not talk. and speed adjustment function safely in the toddler, is also safe mom in the making that takes into account also the safety handle is released only rider mode. If you have any questions about this product by Japan Import, contact us by completing and submitting the form below. If you are looking for a specif part number, please include it with your message.